I LOOOVE how organized and systematic the process of participating as a consignor is. 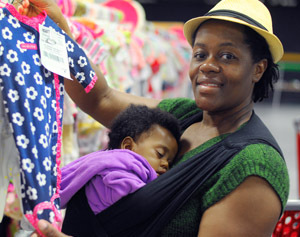 I also love the ability to earn more in my consignor check by volunteering and the benefit of the early shopping time. The cash line is also something that is a perk to have and I think it is fantastic how involved Allison is on every level. She is very approachable! "After about 3 years participating in this sale, I continue to love it. It is very organized and worth the time to consign and buys at. Love it!!!" 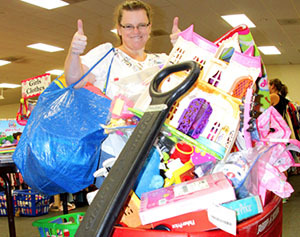 "The joy of donating great clothes, toys, and baby items to those in need." It's fun to meet others and I love the deals! "Finding new treasures to bring home! First time consigning this year-- and it was wonderfully easy to get everything together and dropped off. " "Bargains, community, making money, cleaning out my house, knowing my stuff went to a good home"
It's an easy way to make some extra $! I used to hold a yard sale every year and make a couple hundred $ during a two day sale. I make the same amount with less than half the effort at JBF! "Everyone is amazing!! The whole event is well organized and easy to be a part of. I love getting money for my kids stuff and, in turn am able to buy my kiddo new stuff for the next 6 months. Its fantastic!!" It’s in a big venue & organize. "Easy to shop, easy to consign, made money on items i would have donated! "